An earthquake measuring 5.9 on the Richter scale shook northern Haiti on Sat., Oct. 6, 2018, at 8:11 p.m. Haitian authorities say 14 people died and close to 200 were injured, but those figures are expected to rise. Dozens of homes were damaged and a few large structures, including a church, a school, and an auditorium, wholly or partially collapsed. The epicenter of the quake was in the ocean, 12 miles north of Port-de-Paix, northwest Haiti’s largest city. Damage was also reported in the large town of Gros Morne, and at least one death occurred on La Tortue Island. earthquake of Ile de la Tortue, near Port-de-Paix. Another weaker 5.2 earthquake occurred at 4:00 p.m. on Sun., Oct. 7, some 10 miles north of Port-de-Paix. It was 11 times less powerful than the quake the day before. 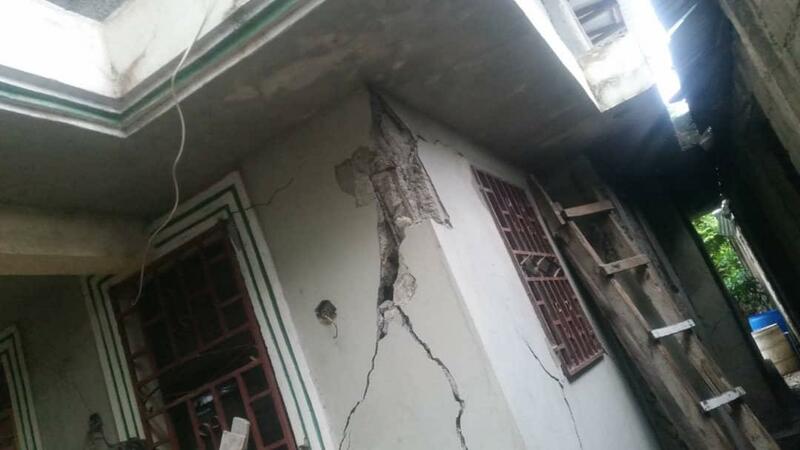 Haiti’s north has registered several tremors and temblors in recent weeks. 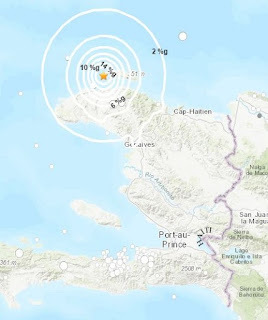 A 5.2 earthquake struck about 36 miles east of Fort Liberté on Sep. 23 at 1.46 a.m. and a 3.6 magnitude tremor struck 11 miles north of Cap Haïtien on Sep. 24 at 8:04 p.m.
Prépetit said Haiti had recorded some 26 tremors between 2.9 and 4.6 since from January to August 2018. 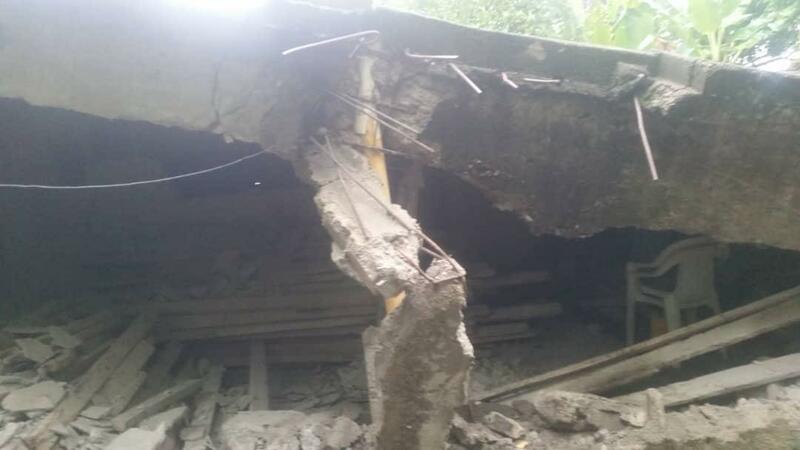 Another house damaged in the Oct. 6, 2018 quake. A 5.9 magnitude seism is about 45 times less powerful than the 7.0 earthquake that devastated the area around Haiti’s capital, Port-au-Prince, on Jan. 12, 2010. Nonetheless, it was still able to cause considerable damage due to the poor construction of many homes and buildings in Haiti. In Gros Morne, a large auditorium completely collapsed and St. Gabriel’s primary school crumpled. 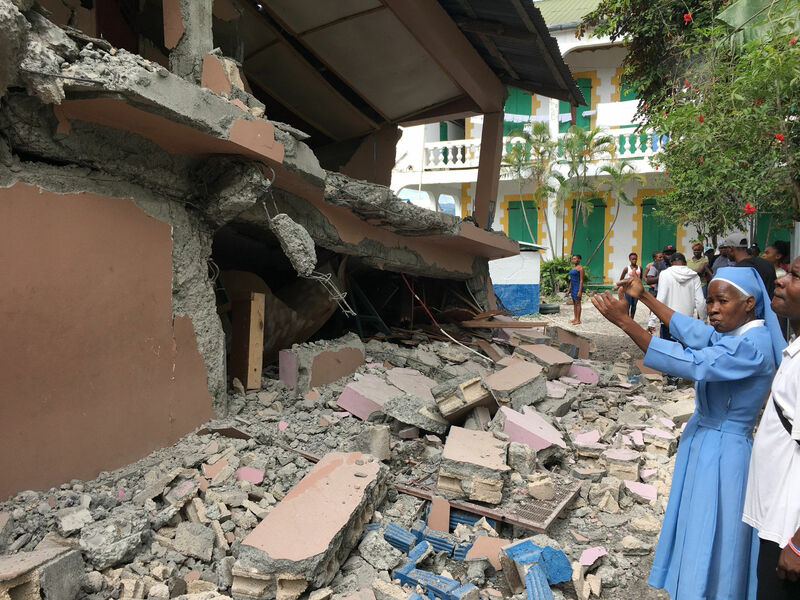 In Plaisance, the front of a large Roman Catholic church fell down, and in Port-de-Paix, the main police station was badly damaged. are of very poor construction. The Septentrional Fault Zone runs the length of Haiti’s northern coast while the Enriquillo-Plantain Garden Fault Zone runs down the middle of Haiti’s southern peninsula. On May 7, 1842, an estimated 8.1 magnitude struck near Cap Haïtien, leveling the city and triggering a tsunami. Some 5,000 were killed by the earthquake and 300 by the tsunami.